06/09/2018 9:10 PM - In a tale of 2 halves, the Sockers FC and the Fort Worth Vaqueros played to a 2-2 tie at Grande Communications Stadium, to a crowd of 902 fans. The Sockers FC scored their first 2 goals in the opening 10 minutes. The first was scored by Nathan Regis at the 6 minute mork un-assisted. The 2nd goal was again, scored by Regis in the 9 minute mark this time assisted by Fernando Gutierrez. The Vaqueros quickly responded by scoring a goal of their own 6 minutes later. Then, with the Sockers FC leading 2-1, a collision involving Nathan Regis around the 20 minute mark brought him to the turph. Regis had to be helped off the field. No substitution was made immediately and the Sockers FC played down one man. The Vaqueros took advantage of this mismatch and quickly scored their 2nd goal in the 26th minute knotting the score 2-2. The 2nd half the Sockers FC were extremely aggressive, but couldn't quite punch in a goal. They had a huge opportunity when Xavi Lao had a penalty kick that was prevented by the Vaqueros goal keeper. 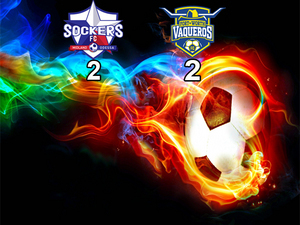 With the tie the Sockers FC are now 3-2-1 but will likely drop to 6th place with a Pts/GP at 1.67 and the Ft. Worth Vaqueros are now 4-1-1 and will likely remain in 2nd place. The Sockers FC next 2 matches will be on the road at Tyler FC then Shreveport FC, before they return home to take on the Dutch Lions on June 23rd, 7:30pm at Grande Communications Stadium.